Potatoes are one of the easiest crops to care for. In fact, they will almost certainly produce a crop even if left to their own devices after planting. But if you give them a small amount of care they will repay you with a bumper crop. Water is their first need, especially when the roots are shallow and they are beginning to start forming potatoes under ground. Weeding and feeding are their next requirements. Potatoes are hungry plants and need lots of nitrogen. Protection from frost is the final essential for a good potato crop. Earthing up potatoes, sometimes referred to hilling up, should occur a couple of times during the growing season. To earth up potatoes simply draw up the soil, with your hands or a hoe, about 10cm / 4ins away from either side of of the row of potatoes and pile it against the side of the potatoes. See the picture on the right (click to see the large version) for a clearer idea of the process. There are several benefits to earthing up potatoes as part of their care plan. First, any potatoes forming near the soil surface will be covered in more soil which will stop them turning green. Green potatoes can cause serious stomach cramps and other problems. 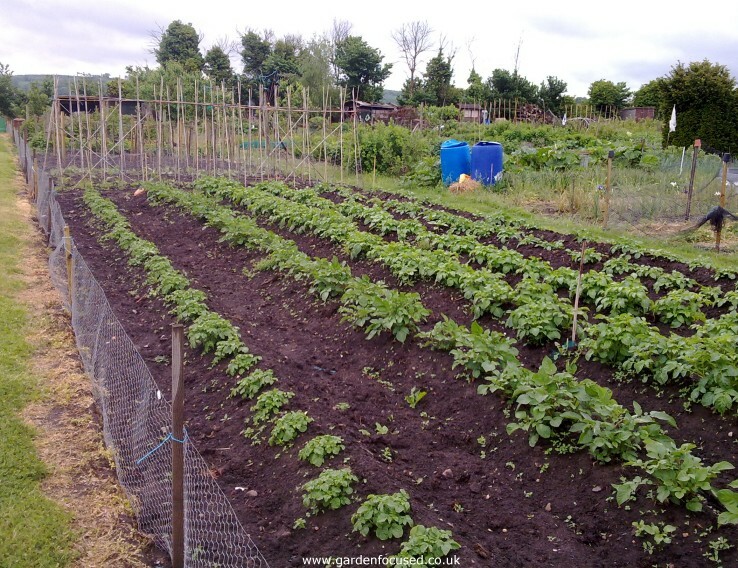 The second benefit is that earthing up will help to loosen the top soil making it easier for potatoes to grow. The final benefit is that weeds can be removed during the process leaving less competition for your potato plants. The first earthing up should occur when the potato plants are about 10cm / 4in high. Draw up the earth around the plants so that it covers the first set of leaves. Don't compact the soil too much around the the plants but pat it down with gentle pressure. Repeat the earthing up process four weeks later. What you will find however, is that if you plant potato rows at the recommended distance apart (roughly 60cm to 75cm) earthing up will be a problem. Taking soil from in between the rows to mound up along the row is llikely to dig up small potato tubers growing away from the main plant or at the very least expose some too close to the soil surface. There are two solutions to this. The first is to increase the distance between rows, to about 90cm to 1 metre. This should allow just enough room for eathing up without the danger of digging up forming potatoes. The second, the one we use, is to mulch the rows about three inches deep with whatever material is available. We have a regular supply of wood chip this year so that is our preferred mulch. But grass cuttings are equally as good. Well rotted compost is also an ideal solution. When the potatoes are harvested, the mulch can be dug into the ground to provide valuable organic material for next year's crop. If any part of a potato plant is above ground, a late frost will damage it. There are two solutions if a late frost threatens your potato plants. The first is to cover the plants with horticultural fleece, straw - anything light which won't crush the plants but will cover them and keep the frost off. The second solution is to perform an early earthing up, but for frost damage limitation, cover the potato plants entirely with soil. The plants will push through the soil again in a couple of days time without any problems. If a late frost does affect your potatoes, don't despair. They will be checked in growth to some degree but they are very likely to recover by themselves. Try to remove any badly damaged stem by clipping them off with a pair of secatueurs or scissors. But leave the remaining, partly damaged foliage to recover of its own accord. Without doubt it will grow again to become a healthy plant and produce a good crop. We know this from hard experience over the last few decades. The key dates for feeding maincrop potatoes are listed below with more detailed information below that. Potato plants thrive with lots of feeding. They need nitrogen for the leafy growth above ground and some of this (though surprisingly little) will come from the well-rotted compost dug in at the end of the previous year. Growmore granules will give a quick fix of nitrogen although it does wash out of the soil relatively quickly. So when the foliage is developing for the first six to eight weeks, nitrogen is the feed to concentrate on. Later, as the potatoes begin to form below ground the potato plant needs potash to form good sized potatoes which will store well. There are lots of methods to feed your potatoes with additional potash. The easiest is liquid tomato feed applied at the rate stated on the pack. Rain will gradually water the potash down to the roots. Another well-known and cheap method of adding potash is to use the ash from burnt pruned wood. Scatter this on the surface of the soil and work in lightly with a trowel. Rain will do the rest for you. One word of warning though about ash. Be very sure what the source of the ash is, treated wood and old furniture ash should not be used because they may well contain harmful chemicals. It's far best to use only wood you have pruned or know exactly where it has come from. If you applied well-rotted compost / manure previous winter then simply fork a well-balanced, long-lasting fertiliser such as bonemeal or blood, fish and bone. Spread it at roughly one handful per square metre / yard. If you did not get round to adding well-rotted compost then add the blood, fish and bone as described above and also add a quick acting fertiliser such as growmore granules at the same rate. Potato plants don't need watering when they are established. The earthing up process will significantly raise the level of the soil trapping in any moisture below. Also the roots of potato plants go down a reasonable depth, enough to find moisture in almost all conditions. Indeed, if you try and water potato plants in dry conditions you would need to apply a huge amount of water for it to reach the lower roots. Watering which only wets the surface or top of the roots will encourage them to grow nearer the surface. This is not a good idea, you want the roots to search out water well below the soil surface. 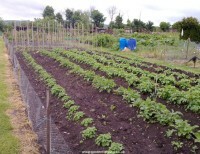 Weeding will be needed until the potato plants reach a height of about 30cm / 1ft. After that the remaining earthing up and the smothering effect of the potato plants should be more than enough to keep the weeds at bay. Potato plants produce flowers which in turn may well produce seeds. The foliage is attractive and does little damage to the growing plants so don't remove it. But when the flowers turn to seed then remove the berries which contain the seed. This will stop the potato plant from putting its energy into growing the seed. The seeds will first appear as green berries, there is little doubt that at this stage the berries are poisonous so keep them well away from kids. They will then turn a deep shade of red or purple as the berries mature. Frequently we are asked if the seed can be harvested, stored and used next year. We haven't tried it but at the same time, we know of no amateur gardeners who have successfully grown healthy potato plants from seed. By all means give it a try but don't put in too much effort and expect to be disappointed with the results. This is a common but disappointing situation with potatoes. The foliage above ground looks very healthy and there's lots of it, but the potato tubers are small. There is not one definite answer to this question but here are some	suggestions. If you feed your potatoes the problem may be too much nitrogen in the ground when the tubers are forming. Nitrogen promotes leafy growth often at the expense of tuber growth. See the section above for timing the feeding of potatoes. Tubers need more potassium to grow large. Tomato type fertilisers have lots of it. Alternatively a feeding regime of long lasting blood, fish and bone fertiliser throughout the season will have a similar effect. If the spring and early summer has provided adequate rainfall the leaf growth will be good. But if that rainfall tapers off significantly during late June onwards, as is often the case, the tubers will suffer. Up to a point (don't waterlog the soil) lots of water promotes larger potatoes. Extra watering may well be required from late June onwards. Some varieties of maincrop potatoes don't stop growing their tubers until late September. Tubers bulk up at a surprising rate and much of this is done in the month before harvesting, surprisingly late in the growth cycle. If the foliage is still green the potato tubers are, in all likelihood, still bulking up. The association between flowering and the stopping of tuber growth is not as some gardeners imagine. Potato tubers do not stop growing when flowers or seeds are produced. They stop growing when the foliage dies down. With new potatoes it is common to harvest just after flowers are produced but the real benefit of this is an early crop, not the fact that flowering will stop tuber growth. For maincrop potatoes, ignore the time they flower, wait for the foliage to start turning yellow if you want the largest tubers. If the foliage of your potato plants is so dense that you can't distinguish between plants then in all probability you have planted them too close to obtain large sized tubers. Close planting is unlikely to reduce overall yields but it will result in lots of small potatoes rather than larger potatoes. Follow the advice given on planting distances given here for maximum potato size. In rich soils, the planting distances can be a few inches further apart.